Vases have always been considered as beautiful decor option. 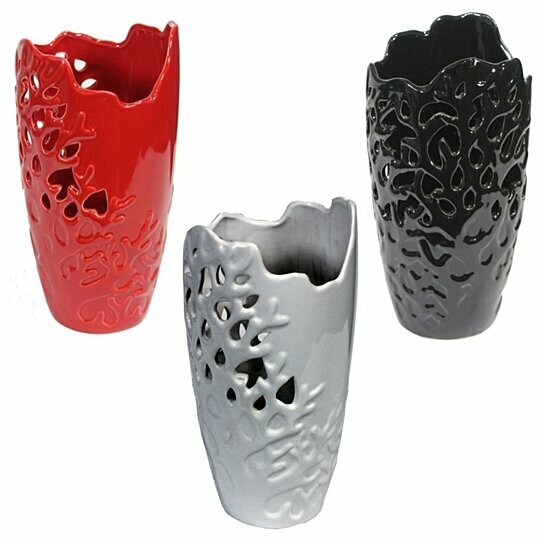 Tall, bold and beautiful, these vases are dyed in gray, black and red, which will easily grab the attention of guests. Keep these three vases together on the table or separately at different places. If you love flowers, you can keep a bunch of flowers in each of the vases. Make them a part of your living room, lobby, guest room or dining space and watch for yourself the difference in the appearance of the ambiance. This product can expose you to chemicals including Cadmium, which is known to the State of California to cause cancer or birth defects or other reproductive harm. For more information, go to www.P65Warnings.ca.gov. Neatly shaped with amazing cutwork design. Worth owning and perfect gifting option.